Finnish builder Baltic Yachts has secured an order for a Reichel/Pugh-designed, fixed-keel, twin-rudder sloop, designed specifically for what Baltic Yachts describes as “short-handed, long-distance offshore cruising”, matching race performance-style speed with onboard comfort. Scheduled for delivery in October 2019, the yacht will feature an overall length of 20.83m and a breadth of 5.5m, and will draw 3.85m. To keep the boat’s weight to a minimum, she will be constructed with resin-infused carbon laminates – which, Baltic Yachts estimates, should limit her weight to 24.2tonnes. 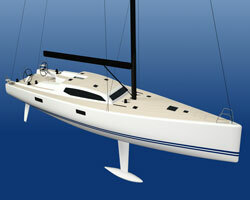 She will also deploy an all-carbon rig and will feature an 8tonne keel. The yacht's structural engineering will be handled by Gurit, while Baltic Yachts and Reichel/Pugh will look after her interior styling. The latter is set to include a double cabin for the owner, two double guest cabins and two forward crew berths. A transom door will grant the owner the opportunity to create a swimming platform at the stern. The yacht will feature an upwind sail area of 274m² and a downwind sail area of 610m², and her main sail’s luff length will be 27.6m. She will also be fitted with a pair of Volvo D3 engines, each rated approximately 112kW.